Nov 05, 2017 in "Sunset Seasons Greetings"
UPDATE November 7 2017: This will also be taking place tonight. 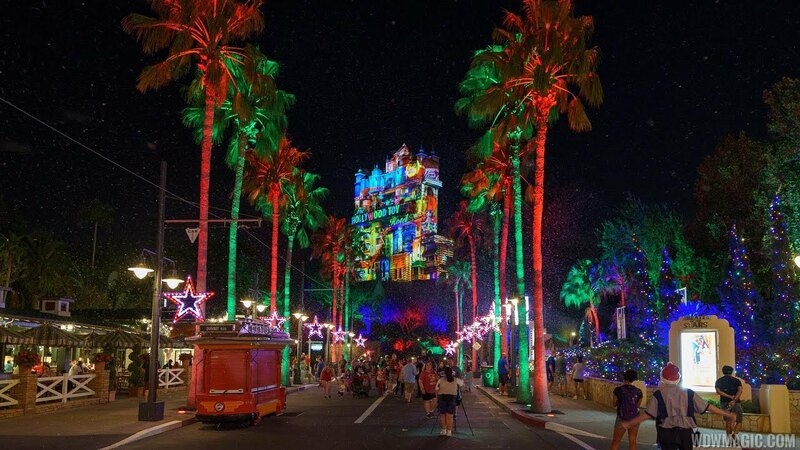 Annual Passholders can get a preview of Sunset Seasons Greetings tonight at Disney's Hollywood Studios. The preview takes place from 8:30pm to 9:30pm on Sunset Blvd, with a special wrist band that is being distributed at the Annual Passholder main entrance line. In addition to seeing the new projection show, passholders will be able to ride Tower of Terror and Rock n Roller Coaster, and be able to buy special merchandise and holiday treats. Although not yet announced, there may also be previews on Tuesday and Wednesday, ahead of Thursday's official start. More from "Sunset Seasons Greetings"